We went to Marrakech (http://en.wikipedia.org/wiki/Marrakech) in November 2010 for my 79th Birthday and again for my 83rd in 2014. Also see a Youtube by a Finnish visitor HERE. 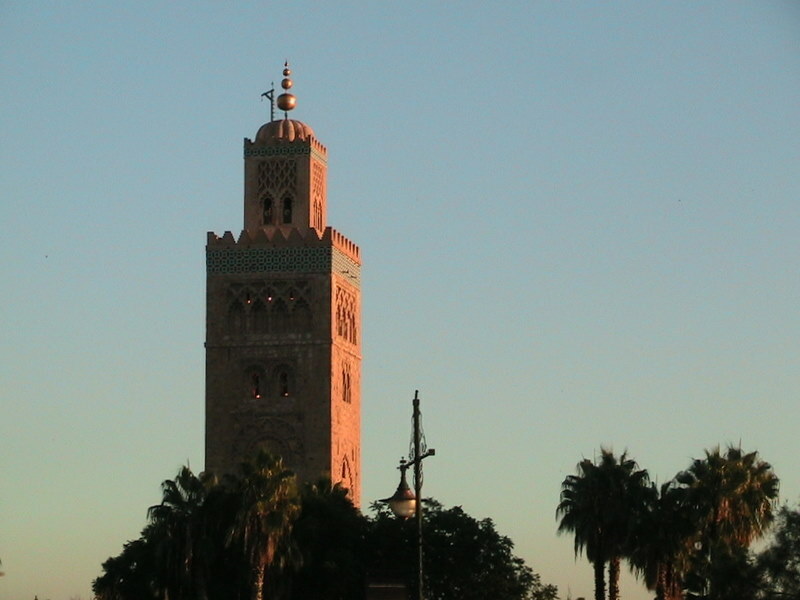 The sun shone every day and the temperature rose to around 30C but was pleasant in the usual Moroccan Atlantic breeze. In the evening one needed a coat. We returned to an icy, snowy Britain. It was just a 4 night 5 day break arranged by Thomas Cook with flights by Easyjet. The flights were very good. Just 3 hours from Gatwick; no delays, fast check-in and too short a trip to need food on board. The only delay was at Marrakech airport due to the slow typing of the check-in guys. Six long queues which hardly seemed to move. When we found our transport driver we were whisked off to the Tachfine hotel in the 'comparatively' new part of the town. It was a fairly easy walk to the old part with its famous Djemaa el-Fna Square, enormous souk (market) and ancient mosque (El Koutoubia, built around ad 1190). The city tourist coach left from a stop just 200 yards from our hotel and to get around town we booked a two day ticket on it. Just 'hop on/hop off' and very useful. 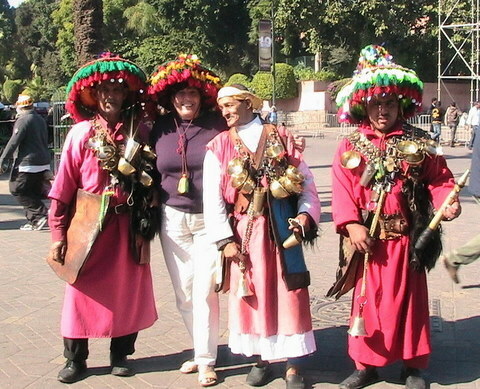 You are issued with bud ear pieces and one can dial at least six languages for the description of the sites on route. There are two circuits : The Historic and the Oasis. We stayed on coach for the former a couple of times, deciding which were the best hotels, where we might go for a swim on the following days. The public bus service is good and cheap but it never ceased to amaze us how many people could be crammed into one bus. 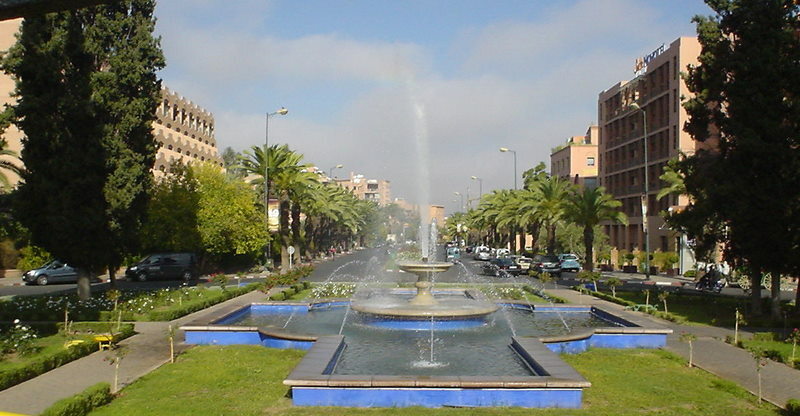 Marrakech is a smart town with more than 150 hotels and broad tree lined avenues with many fountains. 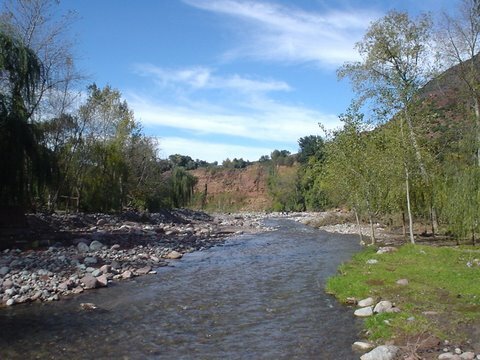 It owes its situation to being on a n old camel route from the Sahara but also because of its proximity to the Atlas range of mountains, which provide it with a fairly plentiful supply of water in what, otherwise, would be desert. The climate is also very favourable with mostly sunny days but with cool breezes from the Atlantic, which is about 100 miles to the West (the seaside resort of Essouira). The water has been conserved in reservoirs, many underground, built hundreds of years ago, making it a favourable place for the population including the various dynasties which have ruled the area. The present king, Mohammad VI is considered to be the most 'enlightened' of his dynasty. Women were granted equality in 1956 and one sees a variety of dress from thoroughly modern (but without bare skin showing) to the occasional burqa. Any mini skirts would certainly belong to a visitor. But local women use the ubiquitous mopeds and scooters, generally without crash helmets. A small minority of women wear a black 'full kit' but, in the main, do not cover the face. They wander freely on their own or in pairs at any time of the day or night. I saw no one in the square respond to the Muezzin's desperate call to prayer. Morocco is a constitutional monarchy, like the UK, but with the King having much more authority than our Queen. The king has a legal qualification and a PhD in Political Science, doing a Thesis on EEC/Moroccan relationships. It is tolerant society and the building next to the ancient mosque is a Christian church. I also found this to be so in Agadir in the south. 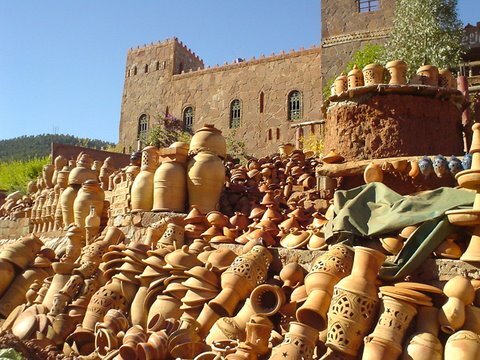 Ethnic groups are mainly Arab and Berber, although the mountain area is mostly Berber. The hotel where we stayed was graded three star. It must have been build around the 1930s and, although clean and the staff were very pleasant, one got the impression that the owners were not spending a lot on it. There were few people staying and it was probably not worth refurbishing. There was a pleasant area ('terrace') at the front of the hotel at street level which served meals in the evening but, as it was bathed in morning sunshine, we felt it was was under-utilised for breakfasts. On the subject of breakfasts, this would be the main criticism of the hotel; the breakfast was not up to standard. The French bread was tough, the cheese was a triangle in silver paper and the pain au chocolate was cold and equally tough. The coffee was good. But, when we can get good, fresh French bread from a convenience store near home in the UK, there is little excuse for 'yesterday's fare' in an hotel. The local bread served with every meal elsewhere was better and that was the basis for food in the square down town in Marrakech, where an egg sandwich was selling for a mere 1 dirham (8 pence). The water in the room was probably drinkable, although we did buy a bottle. Beer and soft drinks were available in the bar. 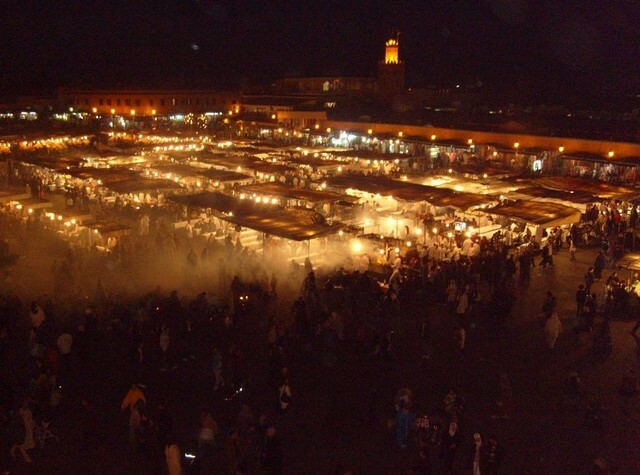 We DID eat in the square this time, as do hundreds of others every night. 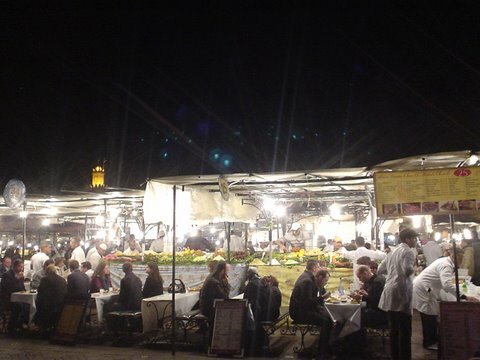 It is a tradition that the food sellers set up their stalls at nightfall and serve up everything from snails and sheep's heads to 'Tagines' of lamb with vegetables and couscous. All very reasonably priced. When we returned to the hotel after our night on the town in the frenetic atmosphere of the square, the receptionist asked if we were interested in a day trip to the Atlas Mountains and we readily agreed. The following morning a mini coach turned up at the hotel. Two other people joined us on the trip and we drove down the splendid Rue Mohammed VI towards the mountains, which can be seen from the town. Soon we were in the foothills on a beautiful cloudless day. We called in at a pottery by a castle and watched the potter turning out yet more pots, although the roadside stock looked as if he ought to take a rest ! I was fascinated to see how the pots were fired and he showed me a modern ten foot high gas fired kiln squeezed in between the stacks of finished pots. 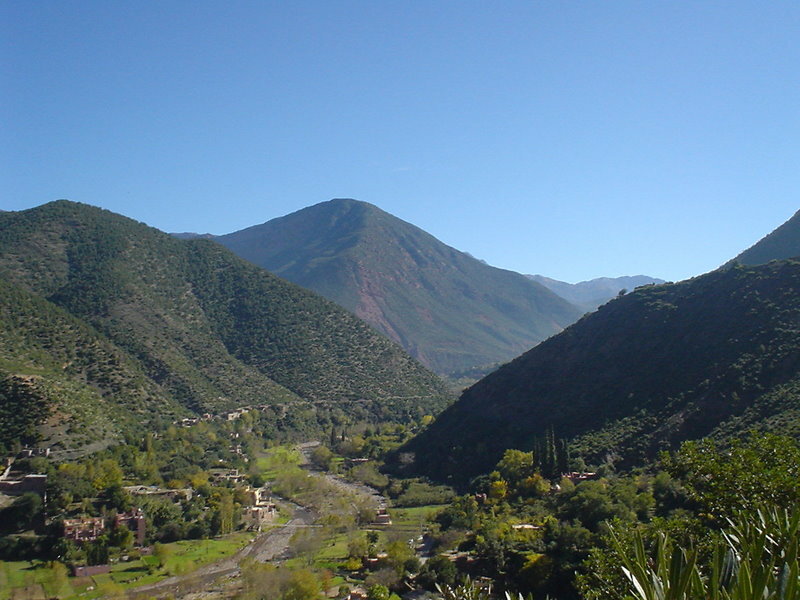 The road narrows and follows the Ourika River into the mountains. It is a wonderful high sided valley, which reminded me of Yosemite, the most beautiful place I have ever been. The area is almost totally inhabited by Berbers and we were shown round one of their homes. We inspected their ingenious flour mill, driven by a small mill stream. It can be used to grind grain into flour or to make couscous. These folks had a nice spot with a little garden by the river, with a swing for the kids. We saw women washing down by the stream in the traditional manner. The river is crossed by numerous suspension footbridges. One of the inevitable hard sell visits in this area was to a place which grew a variety of spices and turned them into lotions, culinary oils and medicines. We saw a woman sitting on the floor working a hand quern, slowly squeezing out oils from seeds. The salesman gave a lengthy lecture on the products, dressed in a clinical white coat - but the prices seemed very high. We didn't buy. But all in all a very pleasant, scenic, day out and one that can be recommended. The following day, back in Marrakech, we took the tour round the Oasis circuit. 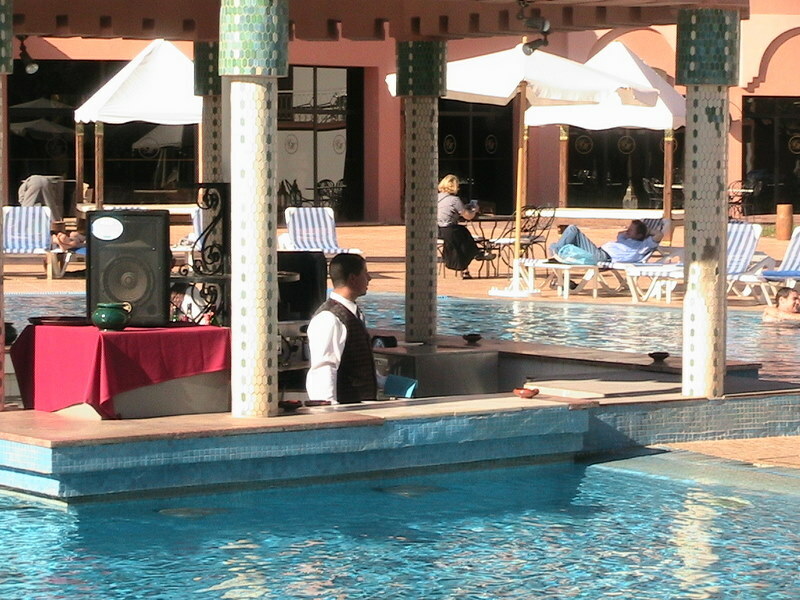 We then headed for the Hotel Mirage for a meal and sunbathe. 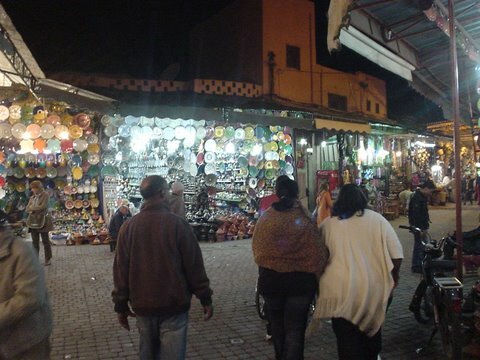 The we rejoined the bus to return to town for the evening in the square with all its fascination, from snake charmers, to traditional story tellers, the superb fresh cold orange and a wander down the limitless labyrinth of the souk. A couple of years ago we also wandered round the craft areas which support the market stalls with fine leather, ceramic and metalwork. Fascinating, but strictly no photographs. That does not apply to the colourful water sellers, who make their money by posing for people. 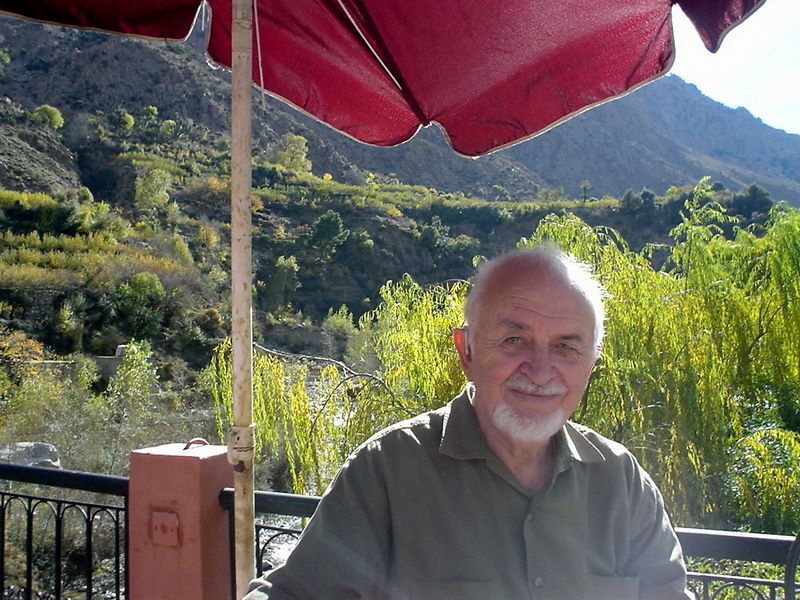 In 2014 we returned to Marrakech for my 83rd birthday. This was an even greater bargain, advertised by Travelzoo. It was to the five star rated Golden Tulip Hotel situated in a fairly new tourist area alongside the massive ancient city wall. This hotel was much newer, smarter and larger than the Tachfine, where we stayed in 2010. The bedrooms were large and spotless, and the food was good. It would be quite a walk to the square, so most people took a taxi at around 50 DAM (�3.50) although some drivers will try to make a little more. On this occasion we got one of the ubiquitous horse drawn carriages from the square, who took is for an hour's drive, dropping us off at the famous Majorelle Gardens (50 DAM each) part way through the trip. The cost was 300 dirham (about �21). We would really recommend this way to travel. The horses seem well cared for and are completely unfazed by the tangle of traffic. The driver also took us to a 'Riad', at our request, where we had lunch on the rooftop with a view of the mountains.There are hundreds of riads in the town, all built around a fancy tiled courtyard with an inevitable fountain and usually accessed via a single tiny doorway in a wall on the street. Some are restaurants but most offer accommodation. A search of the internet and Trip-Advisor will enable you to find them. 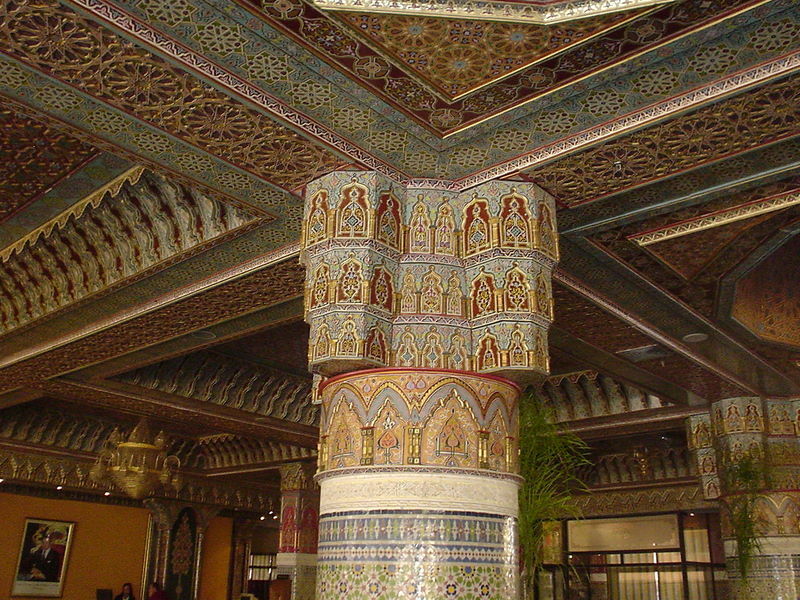 They vary from basic to positively opulent. For our third visit to Marrakech we took it easy, spending one whole day by the pool and enjoying the food. This time the bread was excellent as were the fresh salads. We have never had tummy troubles from eating in Morocco - something one cannot always say about other countries (and cruises! ).